Alfred A. Knopf Books for Young Readers, 9780375840036, 32pp. Black Diamond was the fastest, the best. After every race he’d stand with a wreath around his neck while cameras clicked and smiling people called him champ. But when he stumbles and hurts his leg, all that vanishes. Black Diamond’s new home has high walls topped with razor wire, and the men who live there are called prisoners. Will anyone in this strange new place think he’s the best, treat him like a champ? In this tender friendship story, the author draws on real-life programs that teach inmates to take care of horses and other animals. 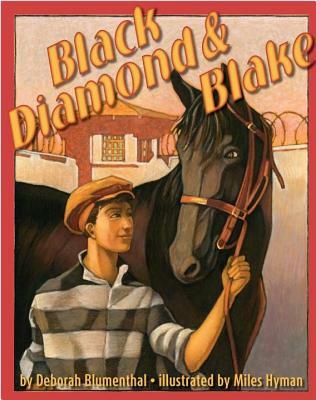 Young readers who enjoy both the thrill of horseracing and the special bond between humans and horses will find much to savor within this richly illustrated, profoundly moving tale. Deborah Blumenthal and her husband, Ralph Blumenthal, live with their children in New York City. Miles Hyman’s rich, painterly art has appeared in the New Yorker, Rolling Stone, Family Circle, and on hundreds of book covers.